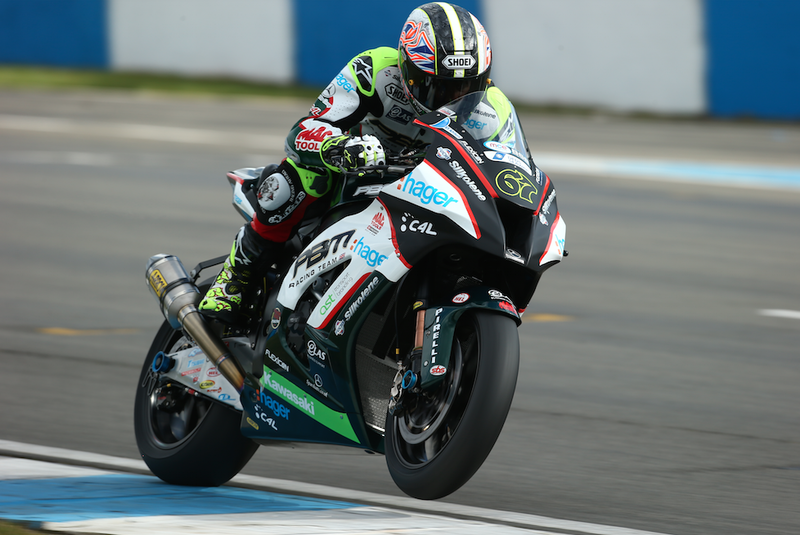 BeWiser Kawasaki rider Danny Buchan pulled not a single punch during the test at Donington Park, ahead of the first round next weekend. The premier class newbie finished the day just 0.222s behind reigning champion Shakey Byrne, who banged in a 01:31.145s lap, making clear his intentions for the 2015 championship. Despite crashing in the closing stages of the test, Ryuichi Kiyonari finished third fastest, just 0.230s behind Shakey. Buchan was happy with the result and stated that there was plenty more to come from him and the bike. How cool is that? Buchan dominated the Superstock championship last year, winning it and catching the eye of Tommy Hill who was putting together a team for his first shot at managing, rather than riding. Based on the numbers, you’d have to agree that both Buchan and Hill have had a good day at the office. The day started slow, rain and high winds meant most of the teams opted to sit out and watch the clouds. Once the rain buggered off, the high winds helped to dry the track meaning that the boys could get out and put on a show for the crowd. Yes, crowd. This was a midweek test in the freezing cold and yet there must have been at least a thousand people there. Josh Brookes drew a mob in the early stages of the day, this was the first time the public had the chance to see the 2015 Yamaha R1 on track in the UK. It looked and sounded ace, but as the conditions improved, Josh only managed to finish in ninth position, 0.680s behind Byrne. Behind the scenes, we heard a pretty humble John Hopkins saying he was at the track looking for a ride for the rest of the year. Unfinished business in BSB and renewed focus were mentioned, as was the desire to give something back the UK fans that have supported him over his career. He had spoken to a number of teams, making it clear that he is available if a seat becomes vacant.